Kon Markogiannis is a photographic artist and researcher with a doctoral degree in fine art. He has an interest in themes such as memory, mortality, spirituality, the human condition, the exploration of the human psyche and the evolution of consciousness. He embraces the indexical qualities of photography and its immediate impact on the viewer but what he is mainly concerned with are the ways “reality” can be transformed. In this week’s guest post for The Culturium, Kon explains that by manipulating the photographic medium and/or combining it with other media, he is able to develop a personal and simultaneously transpersonal language that negotiates between subjective art and the photographic document. He sees his work as a kind of weapon against the ephemeral or, as Vilém Flusser would say in Towards a Philosophy of Photography, a “hunt for new states of things”. THE SEQUENCE OF studio photographs entitled Angel is an attempt to use the medium of photography in order to capture the invisible and intangible. The photographs were shot in the studio using an analogue camera and 35mm film—the ethereal look was created by movement and long exposure. According to several religions, philosophies and wisdom traditions, man may possess different kinds of “bodies”, which are not necessarily material. The Angels represent a kind of bodily identity, which is a spectrum of subtle energies, radiance, rhythm and emotion. With this work, the viewer is encouraged to transcend the indexical nature of the photographic medium and engage with the work on a variety of levels (visceral, emotional, imaginative, intellectual), thus allowing him/her to give birth to various transformative meanings and associations. 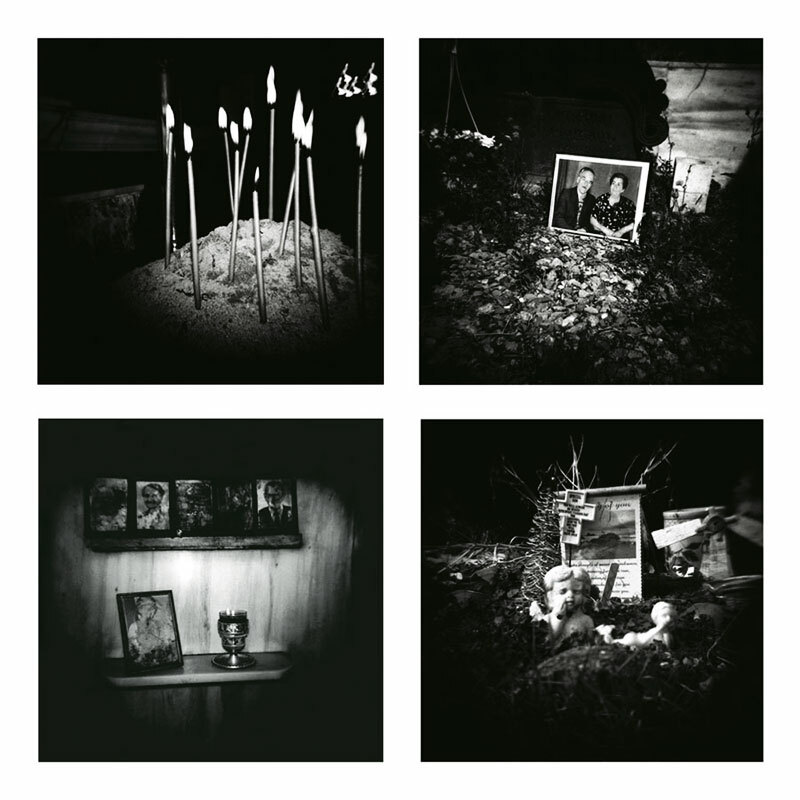 The (Im)mortality series mainly deals with the “memento mori” theme. Photographs are typically used as a way of reliving the past and remembering the deceased. In a certain sense, the photographic medium can be seen as a “weapon” against the ephemeral and the ever-constant flow of time. The act of taking a photograph may be immediate/instant (like pointing and shooting a gun) but its results are timeless. One could say that by photographically recording “reality”, one acquires the ability to slow down time and “immortalize” a transient moment. In L’Acte Photographique, Phillippe Dubois suggests that the act of taking a photograph is “an instantaneous abduction of the object out of the world into another world, into another kind of time”. This work suggests that through the realization that one is eventually going to die, a person’s viewpoint, attitude and priorities may radically change. One’s appreciation of life and fellow people’s lives can be deepened by gaining an awareness of death. By integrating mortality into life, one may accept death as life’s natural conclusion, which one can learn to embrace and be prepared for. Kon Markogiannis, Divine Decay 14 & 18. 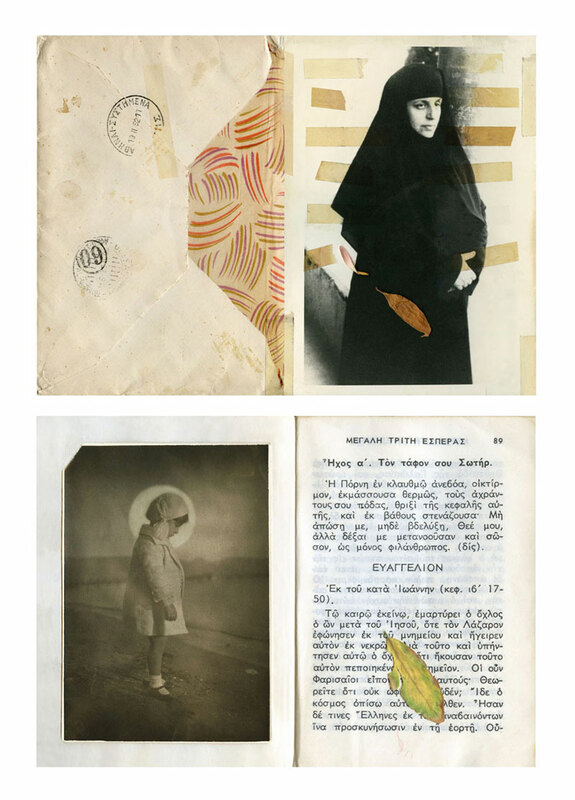 Divine Decay is a series of photographic/mixed media constructions informed and inspired by holy texts, illuminated manuscripts, death memorials, alchemical/occult symbols, sacred geometry, religious icons and Renaissance panel paintings. The work deals with memory, remembrance and decay and tackles issues such as spirituality, which is often neglected but also essential for the well-being and inner balance of the individual in our hypertechnological and increasingly materialistic society. The gritty and damaged appearance of the images alludes to fragility, mortality and the transient nature of earthly existence. Although such subjects are generally perceived as rather morbid and depressing, reflection on their significance could prove to be an illuminating way of reflecting on life. Mind Patterns is a series of cameraless photographs/computer constructions that deal with the artist’s inner need to transcend mundane reality in search of the absolute. 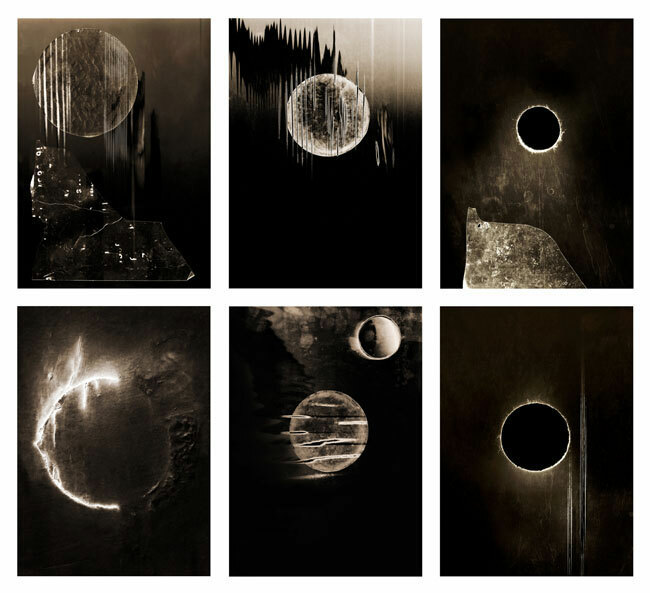 The work was inspired by Tibetan Buddhist theories regarding “universal consciousness” and the art of avant-garde pioneers such as Man Ray and László Moholy-Nagy, whose photographic experiments (solarizations, photograms, etc.) challenged the established notion of photographic “reality”. Manifestations of the ineffable exist in our subconscious where billions of organic and inorganic, human and pre-human images and experiences are stored in a kind of virtual hard drive. Via computer simulation-manipulation, there was an attempt to retract primordial shapes and symbols, textures and patterns, spaces of darkness and luminance from this collective depository and render them into digital post-photographic photograms. The main intention behind this experimental work was to suggest that everyday reality as we normally perceive it is a kind of virtual reality: it is a product of our limited awareness and an illusion imposed by our senses. According to Buddhist teachings, our minds are integral parts and exponents of a universal network of energy (“universal mind”), which is eternal, indestructible and omnipresent. By applying appropriate techniques and practices—such as meditation and artistic creation—the individual has the potential to rise above trivial reality and experience a radiant supra-reality and enlightened state of mind (“clear light”).